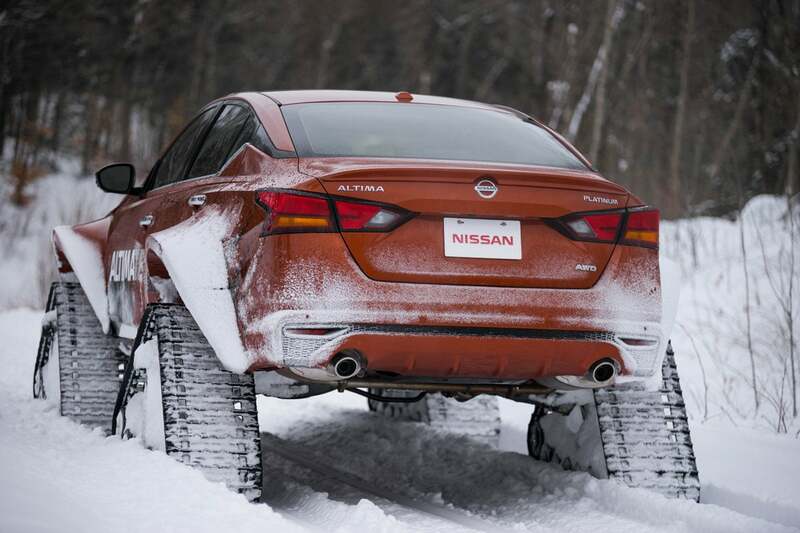 The Nissan Altima-TE AWD is a breath of fresh air in an otherwise dreary mid-size sedan segment. 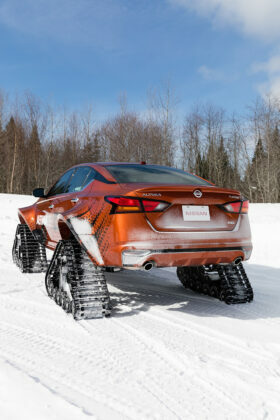 It’s not serious. 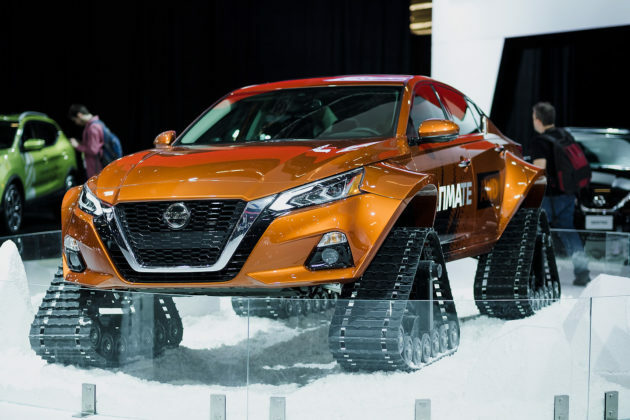 It’s not even mature. Based on the 2019 Nissan Altima, the Altima-TE is about as much fun as you can have in a car in winter. 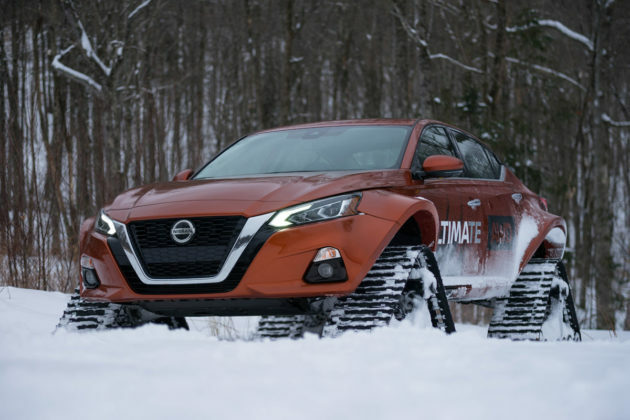 With a major investment in its new Altima, giving it a brand new platform as well as a standard AWD system, Nissan is definitely swimming against the current – every manufacturer on the block seems to be transferring sedan dollars towards SUVs. 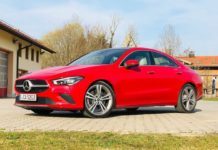 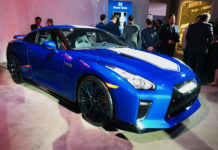 In explaining this move, Nissan stipulated that there’s still a large portion of buyers who are looking for sedans, and they are treating “themselves” in doing so. 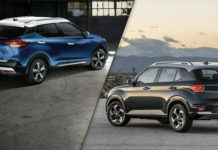 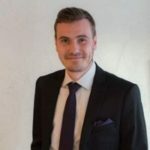 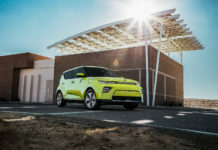 In contrast, SUV buyers often tend to cater to the needs of other people such as their family and everything that needs to be hauled with it. 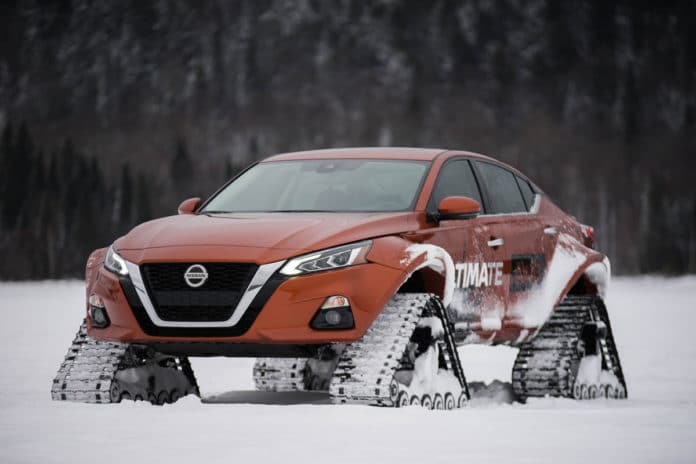 That being said, to further reinforce this statement, Nissan decided to build the Nissan Altima-te AWD as a promotional vehicle, it could be called the “ultimate selfish statement”. 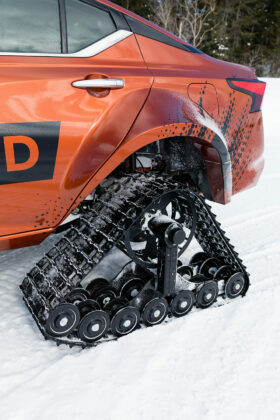 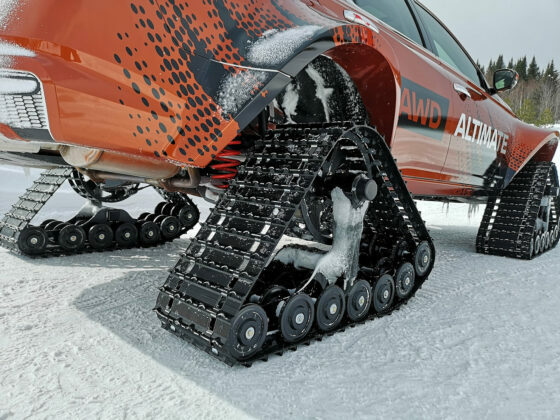 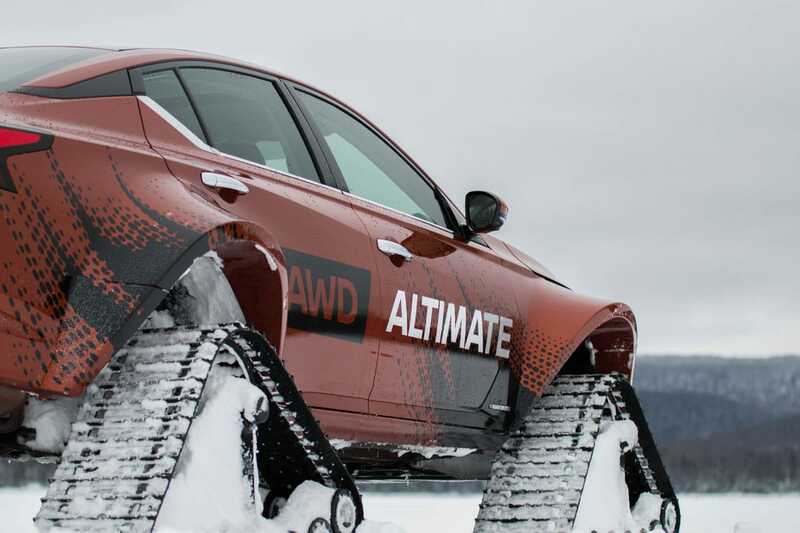 This beast of a sedan has traded its alloys for a set of DOMINATOR tracks made for thick and fluffy snow. 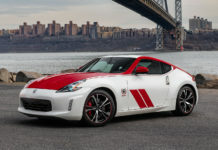 The engine and interior remained stock, but the suspension and body sustained quite a few modifications to accommodate the new “implants”. 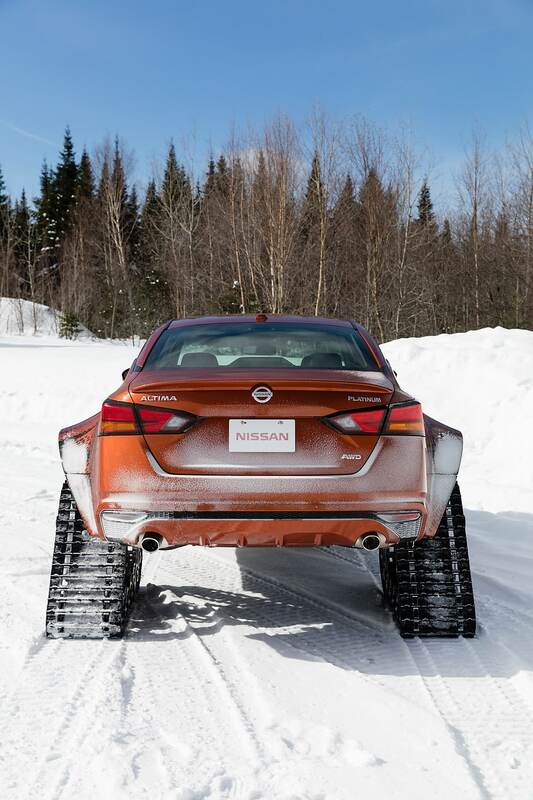 The Altima-te AWD sports 180-millimetre wide front and rear fender flares, and the suspension components were raised by 50 millimetres. 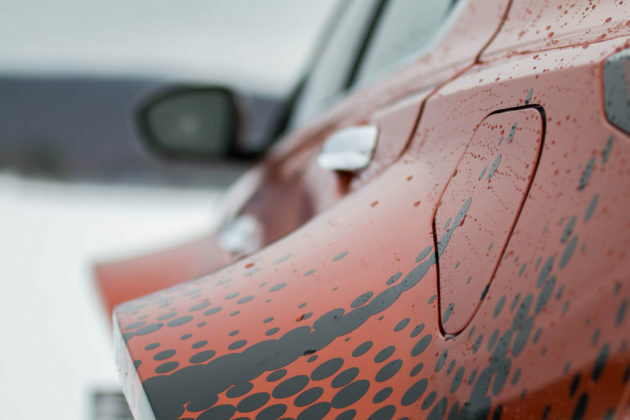 The geometry was adapted using custom parts, but the brakes are 100% original. The Nissan Altima-te AWD felt right at home in the perfectly manicured Mecaglisse racetrack in Quebec’s Laurentians. 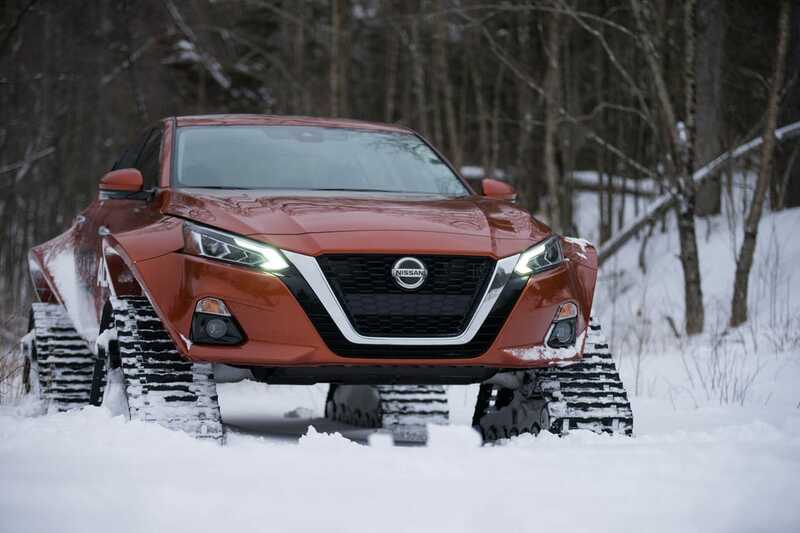 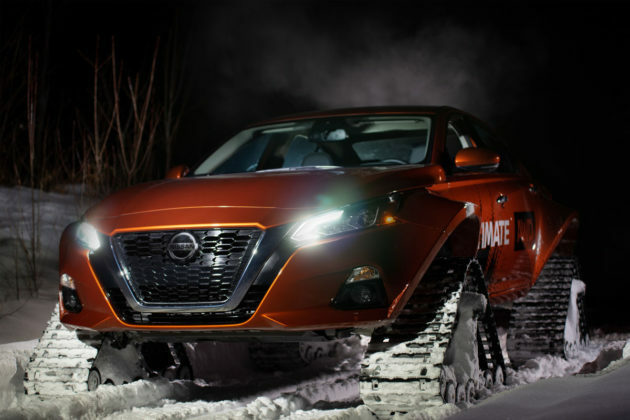 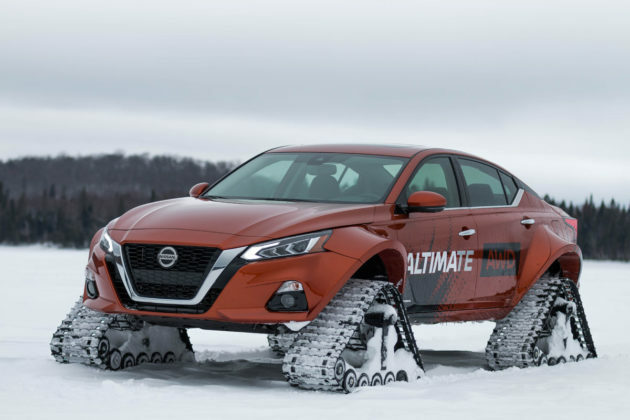 Although we would have loved to have five feet of snow to dig in with this Altima-te toy, the racetrack set out for us had a few tricks up its sleeve. 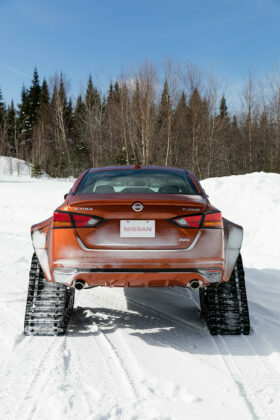 The first thing that came to mind when we first glanced at the car is “will 182 horsepower be enough to pull this thing?” Sitting high off the ground, and wearing what looks like shoes that weigh a ton, the question was inevitable. 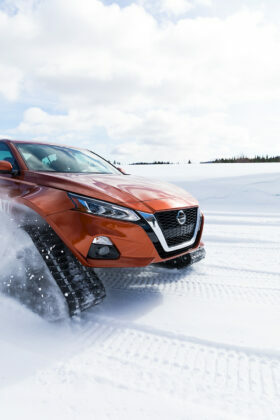 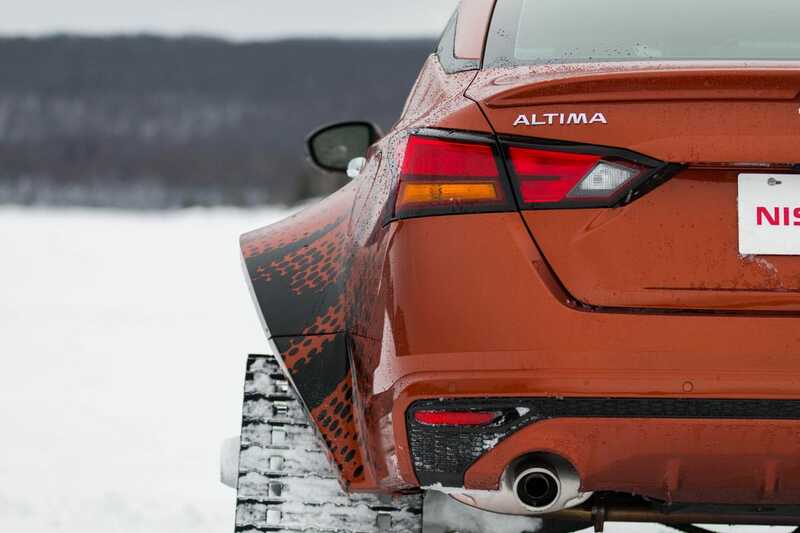 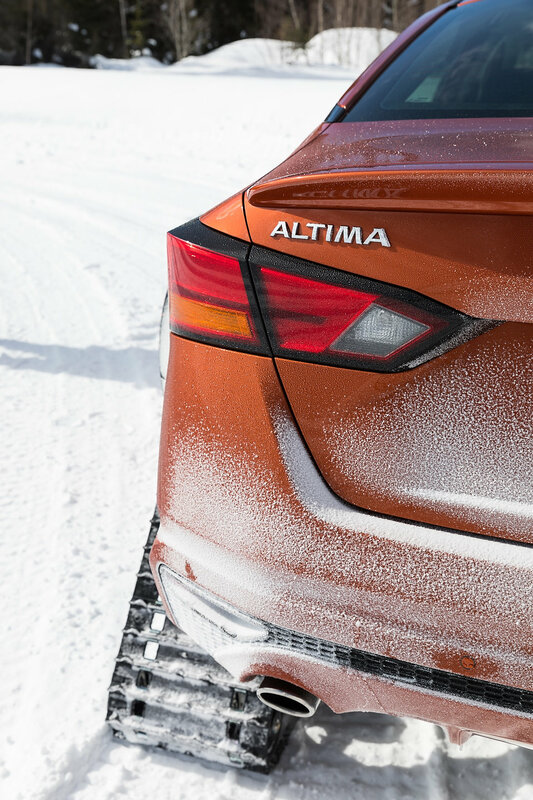 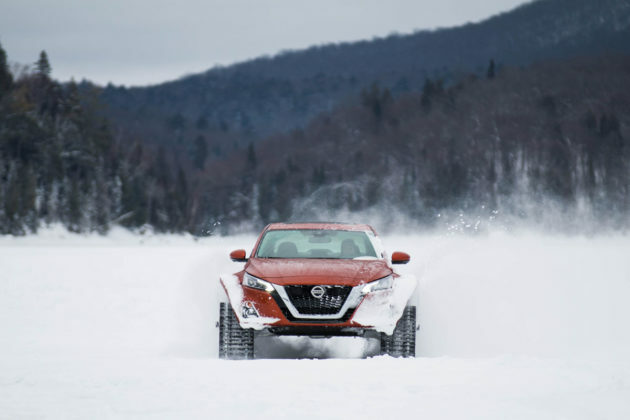 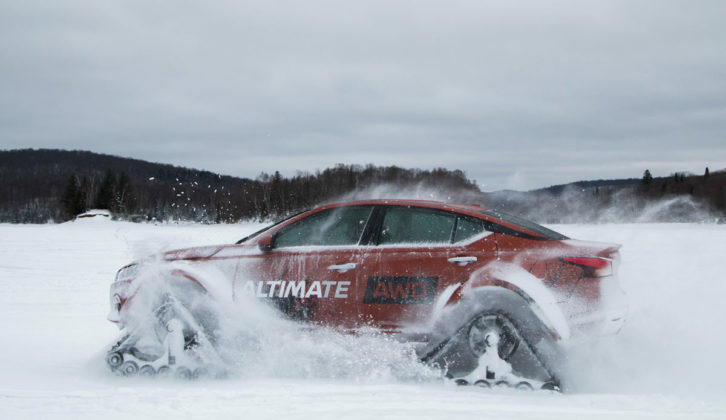 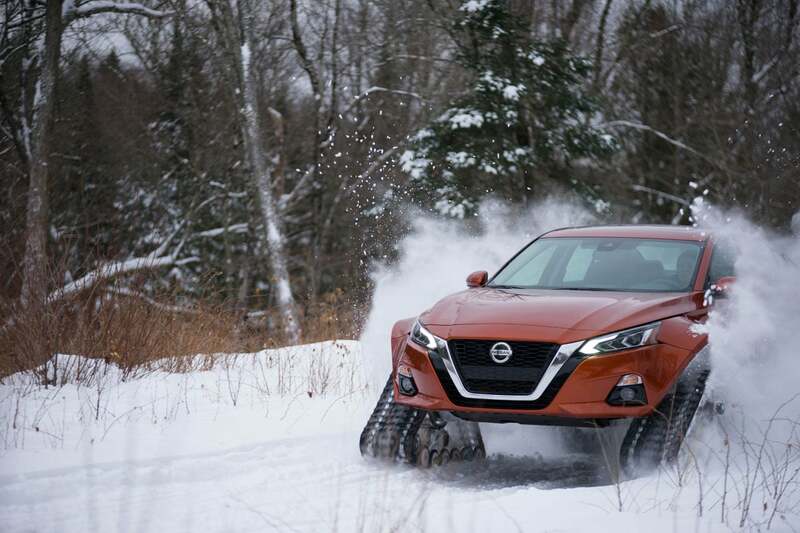 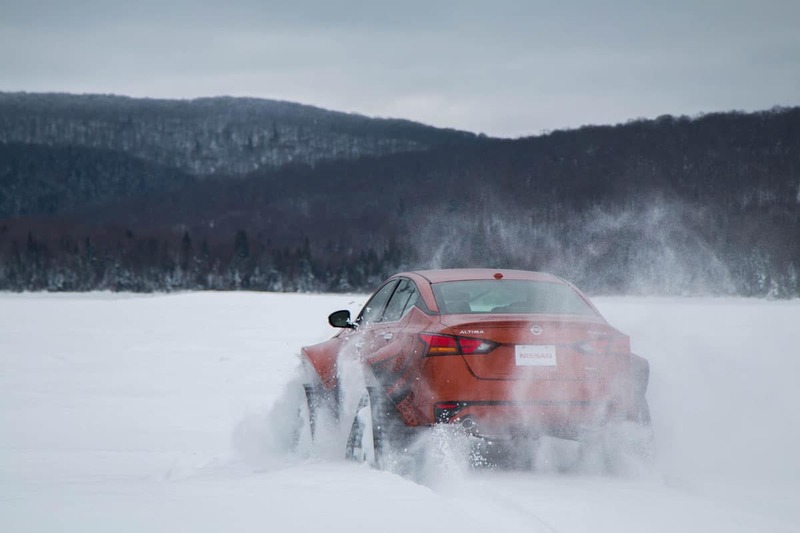 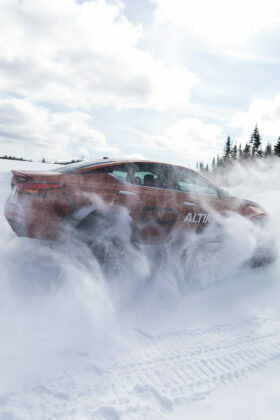 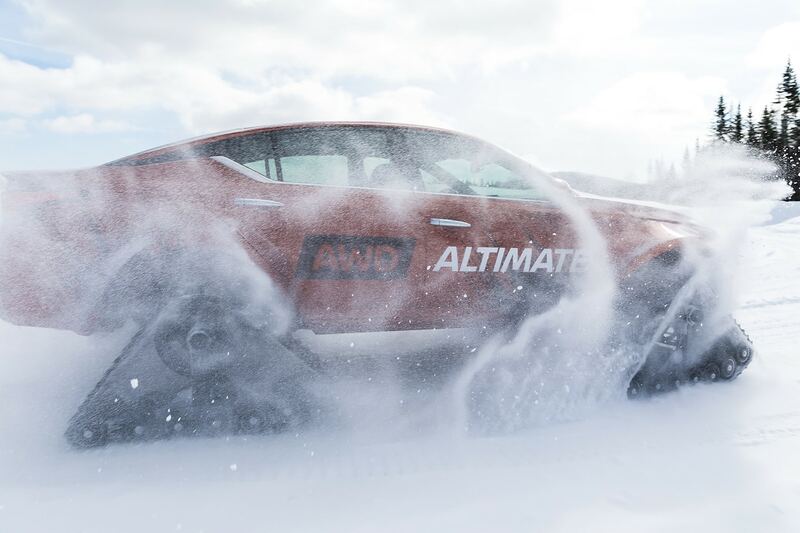 Speeding up through the snow, however, the Altima-te seemed to wear these shoes perfectly, not only capable of climbing on top of reasonably sized snowbanks, it was also able to get up to speed fairly fast. 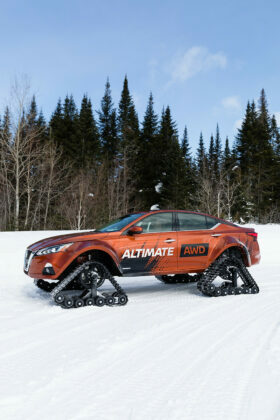 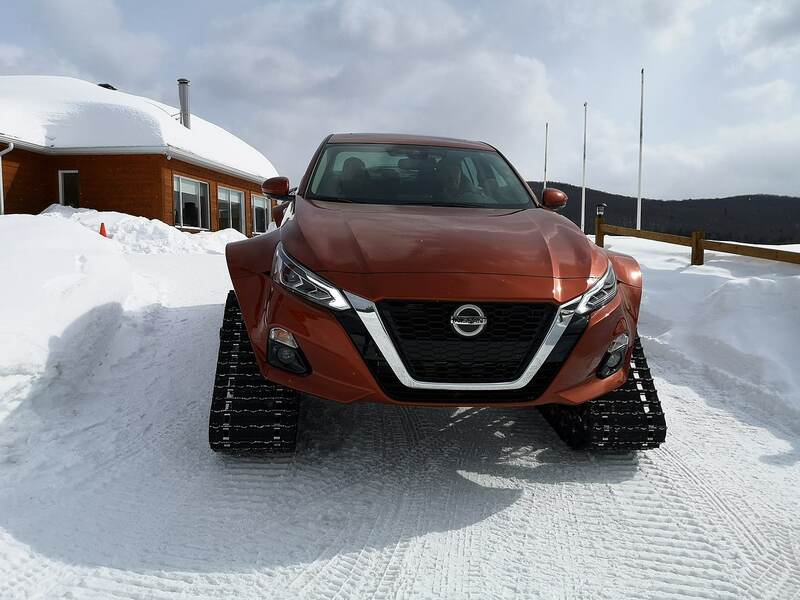 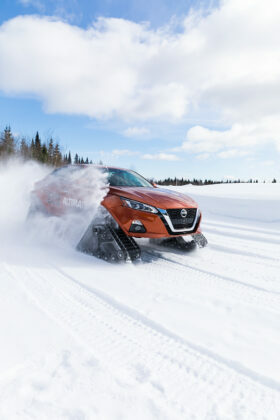 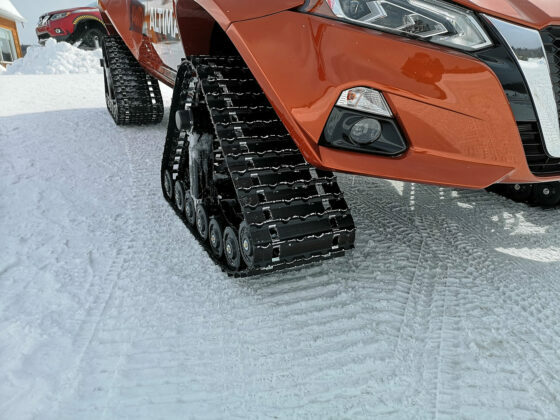 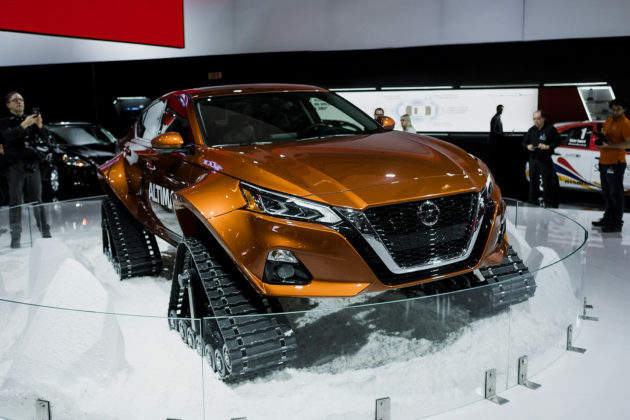 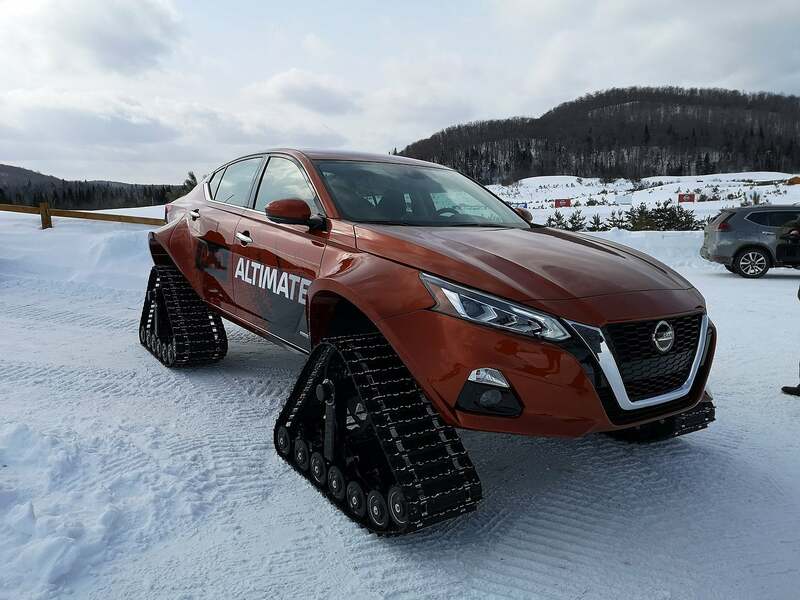 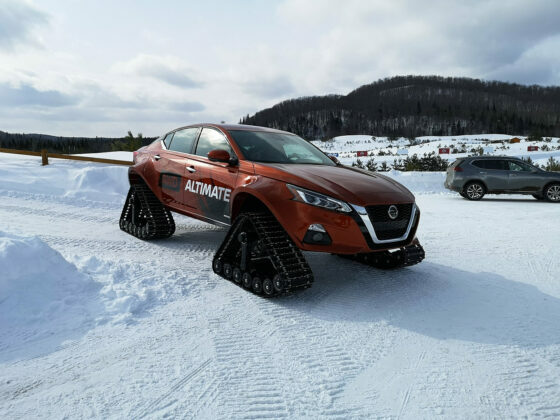 So Nissan’s 2.5-litre engine paired with the Xtronic CVT – a transmission type that is also used in snowmobiles and UTVs, turned out to be adequate for the application. Steering could have been another concern; unlike wheels, these tracks are long and wide. 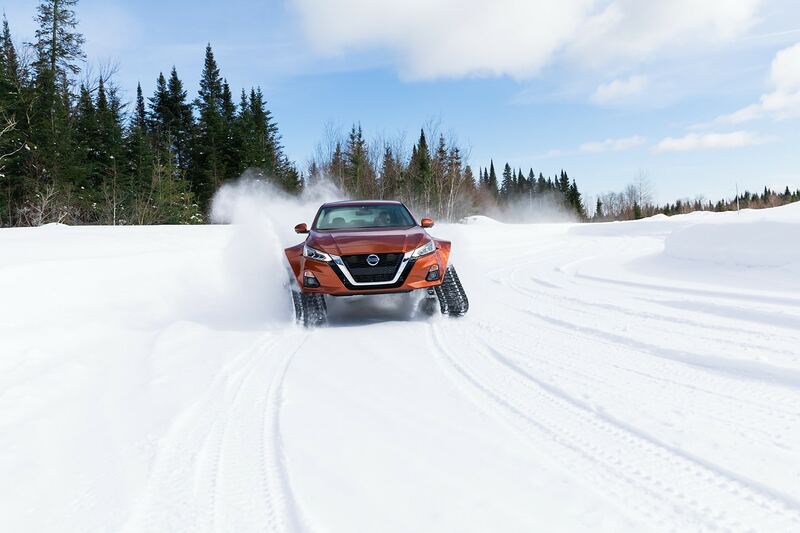 However, the Altima’s steering system enabled fluent turns and smooth transitions throughout the series of tight turns on Mecaglisse’s proposed itinerary. Think of the Nissan Altima-te as a snowcat with heated leather seats, Apple CarPlay and a Bose sound system. 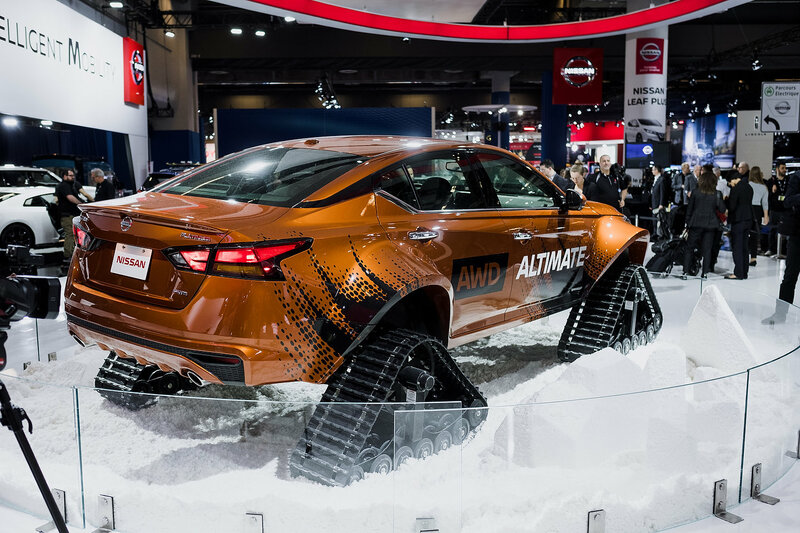 It looks cool, can climb stuff and is definitely a show stopper. Although useless for the common individual, this type of toy is a great way to showcase the new standard AWD system on the 2019 Altima. 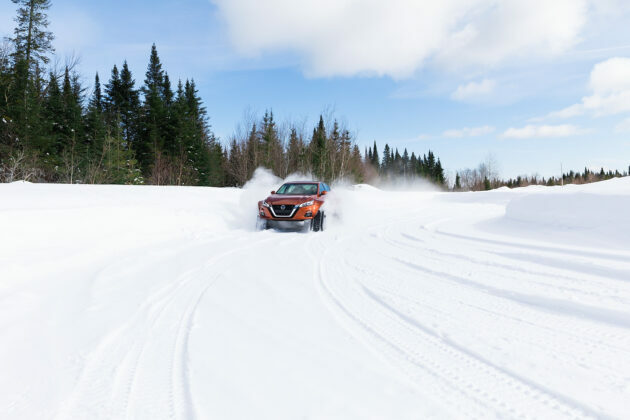 And the fact that it was modified entirely by Quebec-based Motorsports in Action (MIA), which also races McLarens in IMSA Michelin Pilot Challenge, made the whole experience even more special for us.